It's here, it's finally here. I have wanted one of these since I was in college and I started babysitting for the Semmes. Yvette had one on her kitchen counter and Mathilde and I would use it to make homemade brownies. I was in love. I wanted one of my very own. It's the kind of thing you register for when you get married. Since I have no idea when that is going to be, I got tired of waiting and bought one of my own via amazon.com. It was sitting on the front step of my house when I got home from work today. 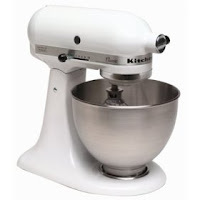 I am now the proud owner of a kitchen-aid stand mixer. The only bad thing is I have to wait a week to use it as I am off to Myrtle Beach this weekend for a conference. I'm still excited that it's here.